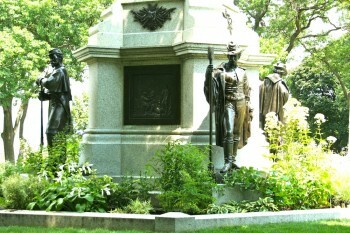 In August of 2002, The Green-Wood Historic Fund rededicated New York City’s Civil War Soldiers’ Monument after a year of restoration. It was originally dedicated in 1876 on the Cemetery’s Battle Hill. The Historic Fund’s Civil War Project, an effort to identify and remember Civil War veterans buried at Green-Wood, was born of the enthusiasm felt at the rededication ceremony. Without Internet access to databases and e-mail, the project could not have been achieved on this scale. When the project began, researchers believed, based on earlier informal searches, that there were approximately 500 Civil War veterans interred here. 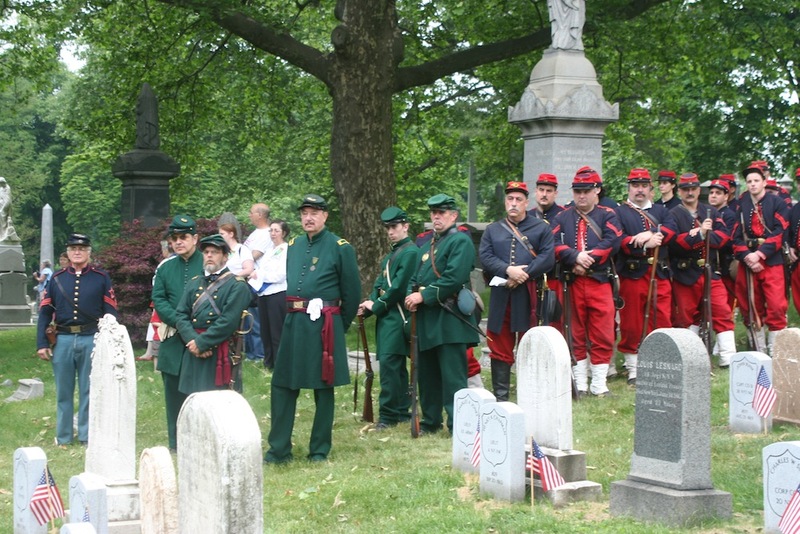 Almost six years later, approximately 3,300 Civil War veterans have been identified at Green-Wood. Hundreds of volunteers have completed thousands of hours of research in this ongoing project. Among other things, part of the research included comparing 162,000 names of men who served in New York City or Brooklyn regiments with the Cemetery’s database of about 560,000 permanent residents. National and international publicity generated additional information from the public for this project. If you know of a Green-Wood veteran, please contact Green-Wood historian Jeff Richman at jeff@green-wood.com. Once a Civil War veteran was identified as being buried at Green-Wood, project volunteers wrote a biography from soldier histories, obituaries, pension records, official records and other sources. We then turned our attention to making sure that all veterans’ graves were marked. Our Civil War Project has applied to the Veterans Administration for 1,300 gravestones and bronze markers to designate previously unmarked graves or supplement now-unreadable gravestones. Over the next few years, these markers will be installed at the final resting place of each of these veterans. Ironically, our Civil War Project has lasted longer than the Civil War itself and it is not over. Because of incomplete or incorrect records, common names and other challenges, there are undoubtedly many more veterans to be identified. We continue to add more veterans to our list as we find them. Are you a Civil War buff? A good researcher or writer? Interested in uncovering buried history? If so, Green-Wood could use your help! Click here to fill out our volunteer form. Green-Wood is on the Civil War Preservation Trust’s list of Civil War-related sites worth exploring. 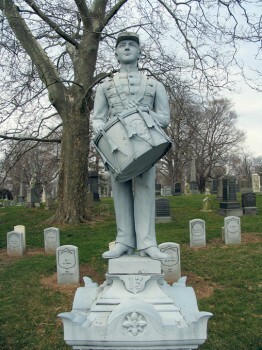 There are many Civil War monuments throughout the Cemetery grounds, including New York City’s Civil War monument, the Drummer Boy, and the monument to General George Crockett Strong. Strong led the brigade attack on Fort Wagner, which was depicted in the movie Glory. In 2008, The Green-Wood Cemetery published the richly illustrated book Final Camping Ground: Civil War Veterans at Brooklyn’s Green-Wood Cemetery, In Their Own Words by Green-Wood historian Jeffrey I. Richman. The book is a collection of letters, journals, reports and the incredible stories of Green-Wood’s Civil War veterans. Supplemented by a biographical dictionary on CD of all the veterans discovered at Green-Wood, the book can be ordered online for $30 plus shipping or can be purchased at the Cemetery offices. 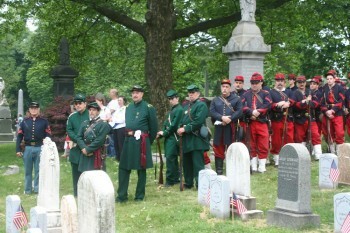 Click play below to watch video coverage of our Civil War project from Green-Wood’s Memorial Day 2011 events.